Welcome to the Peabody Youth Girls Lacrosse Website! Our mission is to teach the game of girls' lacrosse in Peabody, Massachusetts and foster excitement for this fast growing sport. We hope to enhance and improve participating players' skills in a positive environment while at the same time emphasizing good sportsmanship and teamwork. Currently do not have a schedule for our outdoor practices. We will need to wait until the city officially opens our practice location at Higgins Field. The timing is dependent on what Mother Nature has in store for us the month of March. Games will be held on Sundays. This year the Mass Bay Girl Lacrosse League will be doing the schedules. Once the schedule is determined they will also be able to be listed on this website. Opening game will be April 7. There are no games on Sunday April 21 and no games Memorial Day Weekend. The last game of the season is June 9, and there will be a jamboree the weekend of June 15 and 16. More info about the jamboree will come sometime in April/May. We are excited to let you know that we have indoor pre-season practices scheduled. They will be at Danvers Indoor Sports off Rt. 114 and Latitude on Route 1 in Peabody. Mouth guard - must be a color – no white or clear mouth guards are permitted. Water Bottle – clearly labeled with players name on it. As in the past coaches would appreciate if all the girls wore their Peabody Pinnies to EVERY practice. It makes it easier for them to conduct their drills. The pinnies are White and Columbia Blue. If you do not have one I will bring them to the first indoor practice. Cost is $15 a pinnie. If you have any questions, please do not hesitate to reach out to Lea Vounessea at 978-729-7725. 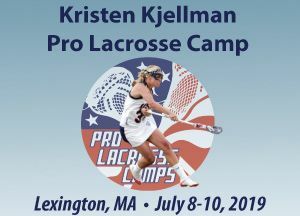 Kristen Kjellman was a 2-time Tewaaraton Award winner at Northwestern University and All-World Team midfielder and World Champion with Team USA! Kristen will be a full-time coach all 3 days of camp!